Coconut Brownie Bites to Remind You that You Are Good Enough! You are probably wondering what coconut brownie bites and being good enough have in common at all. That is definitely a valid question. Maybe it’s a bit of sleep-deprived delirium. Maybe it’s just that my life is such a disarray that I can barely even think straight. Maybe you’ve noticed that I haven’t posted anything all week up to this point (chances are though, you’ve been too busy gawking at all the yummy Valentine’s Round-ups, like this one, to even notice). But really, I haven’t felt inspired. I haven’t felt like anything I wanted to bake was good enough. My jumbled thoughts didn’t seem like good enough. I was too overwhelmed to come up with anything that was good enough. So I just went through the last feel days feeling not good enough, when it hit me. I was taken back to last weekend at the Build Your Blog Conference I attended. I sat almost directly in front of one of the most inspirational women I have ever heard speak. Meg Johnson. She was the keynote speaker at the conference, and her words are still following me throughout this week. I was looking at my not-so-pretty brownies and thinking I should just dump them. And I wasn’t coming up with anything inspiring to say about brownies. I haven’t been in the Valentine’s mood because my wife is away. I was just feeling not good enough. Let me tell you something. I am good enough! 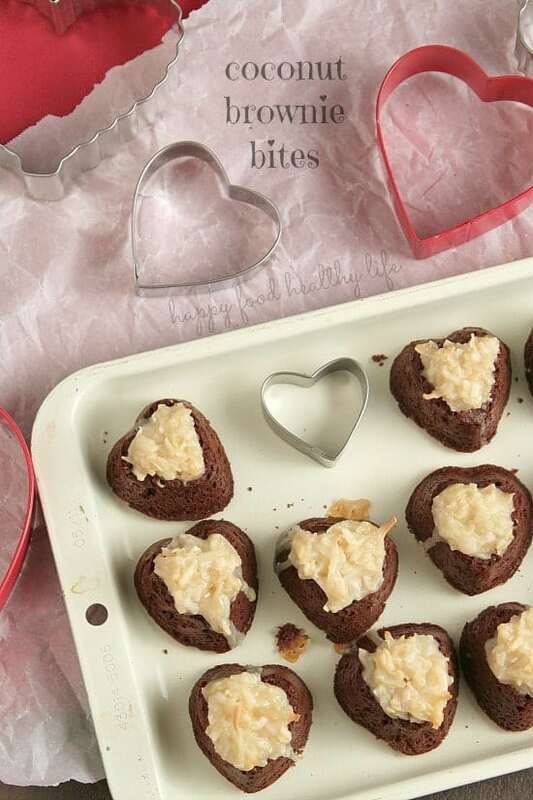 These brownies will be good enough for you, especially if you’re in a hurry for something to treat your loved ones this Valentine’s Day. The thing is, they may not be pretty, but you will pop them in your mouth so fast that you won’t even realize what they looked like. There’s nothing like a mediocre recipe to remind you of an important life-lesson. Who would have thought I would have found it in my ugly brownies? I was so inspired to make something of these brownies that I even re-did the first really crappy good enough photoshoot and vowed to do it better. And what do you know – I kind of love these ugly brownies a little bit now! And I’m sure you will too! Preheat oven to 325 degrees F. Spray non-stick spray on your individual-heart-mould pan (any other shape will work) and set aside. Melt 1 cup semisweet chocolate chips and 1/2 stick butter in a saucepan over low heat, stirring. Off the heat whisk in 1/4 cup brown sugar and 1/2 cup granulated sugar. Transfer mixture to a medium bowl. Whisk in 2 eggs, one at a time, and 1/2 teaspoon of vanilla. Add batter to prepared baking pan and bake in preheated oven for 11-13 minutes, until toothpick in one of the center cavities comes out clean. Let cool completely before removing from moulds and topping with coconut topping. While brownie bites are cooling, mix all Coconut Topping ingredients in a small bowl. Once brownies are cooled completely, run a knife around the bites and pop them out of their mold. 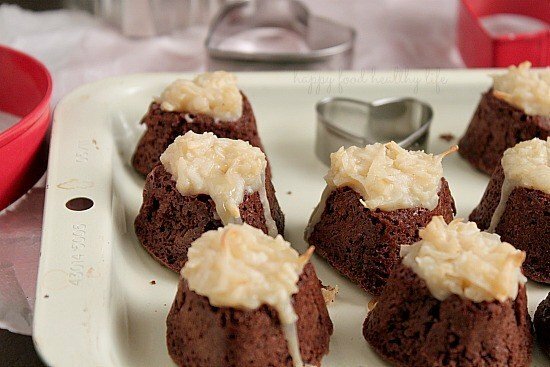 Top each bite with about a Tablespoon of coconut topping and enjoy! 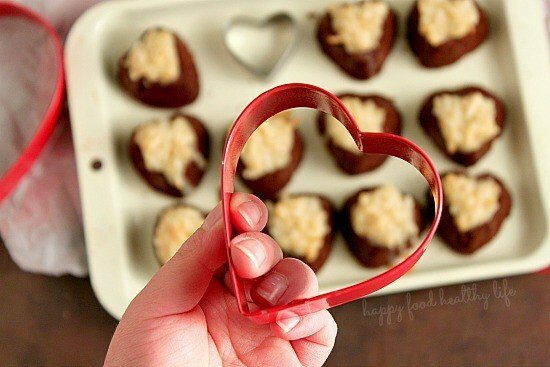 I love these little heart shaped coconut brownies! Yummy!! thanks Renee! I hope you try them out! I wish I could have attended that conference. I think WE ALL have days, weeks, or even months where we really don’t feel all that good about ourselves. Totally can relate! But it sounds like you powered through it Holly. Glad you didn’t’ dump these brownies bites! I think they are perfect! I love the coconut topping! Aren’t they amazing? As the day goes on, I almost can’t believe how much I hated my photos and how ugly they looked! I’m so glad I’m not the only one that gets in these slumps and that other people can relate. Thanks Lisa! I’m counting down the days… literally. And then I can share these brownies with her!! Thanks Heather! They really were yummy – I just wasn’t feeling inspired by the photos and have been really overwhelmed – BUT things are turning around and looking up! What an inspiring post, you’re right we are too hard on ourselves. We are all good enough, love that. Thanks for sharing on the weekend re-Treat link party! I’m so glad you found inspiration from my post. I agree, the “tada” list is a great idea. I need to do that more often. So many days I feel like I didn’t accomplish anything on my to-do list, but I need to take note of everything I DID do instead!